The Lord St. Oswald Collection contained twenty-five U.S. Large Cents, all dated 1794 except for a single, average-grade 1793 Chain Cent. 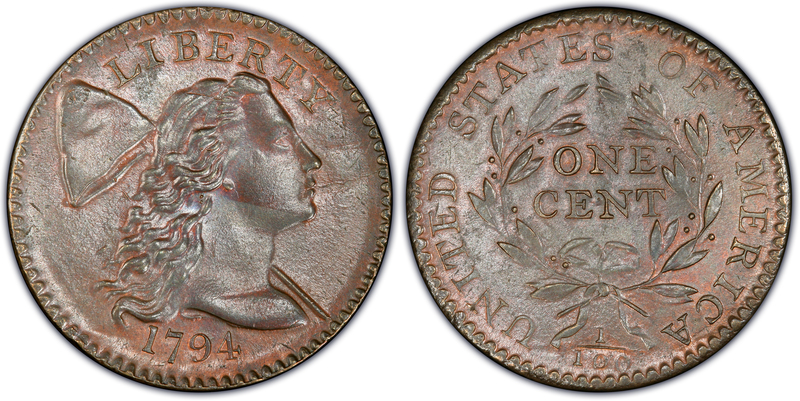 The 1964 Christie’s sale offered twenty-two Large Cent; only three appeared in the 1992 sale. Fortunately for future researchers, the catalogers at Christie’s attributed all of the Large Cents by Sheldon variety numbers. Today, we know the whereabouts of most of the coins and their “modern” grades, all of which is revealed below. For purposes of brevity, the Lord St. Oswald Large Cents will be presented in groups of five coins over five installments; this is the second installment of the five. Analysis: In 1964, the American firm of Stack’s purchased this coin and, from there, it wended its way through the collections of Dorothy Paschal, Dr. William Sheldon, and “Ted” Naftzger (a familiar course for many of America’s best Large Cents), then to Dr. Allen Bennett and Walt Husak. In his Condition Census, Bill Noyes listed this example and one other (Lot 151, see following) as tied for finest known honors. Walter Breen (using Del Bland’s data) recognized this example as the finest S-57 in existence. It is from a late state of the dies, which accounts for the “weakly struck” portion of the description in the 1964 Christie’s catalog, but the surfaces are superb and both sides feature ample amounts of original mint red color – a very rare finding on any Large Cents of this era. Analysis: The price history of this coin has been impressive. New York dealer Lester Merkin purchased this coin for approximately $1,820 at the 1964 Christie’s sale. When it reappeared at auction in 1971, it had nearly doubled in price. By 1973, the price had more than tripled. From 1973 to 2002, the coin traded hands rarely and privately, eventually selling for $35,650 in a January 2002 Stack’s sale. Finally, in February 2013, this coin sold for $189,750 or more than 100 times the original purchase price. Bill Noyes recognized this as one of the two finest examples of the variety (see the previous lot). Breen/Bland placed it at fourth finest known. The reverse has more mint red than any other S-57. Analysis: The present whereabouts of this example is unknown, nor is it likely to ever appear. 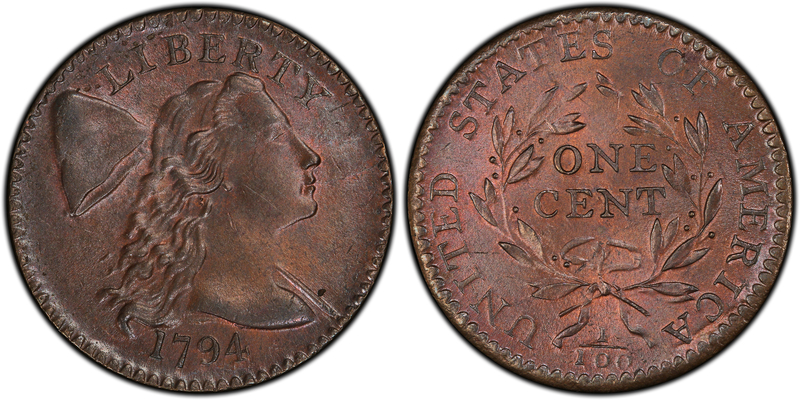 Its lower condition is incongruous with the other 1794 Large Cents in the Lord St. Oswald Collection. It was not significant enough to merit attention, so it likely melted into some collection where it sits unrecognized today. Analysis: This is the finest S-59 known to exist and it is the only Red & Brown survivor. Like many great Large Cents, it followed the Paschal-Sheldon-Naftzger route following the sale, after which it passed into the collections of Jack Wadlington, then the late Dan Holmes. In 2009, it sold at auction for $276,000. Both Noyes and Breen/Bland placed this coin in the number one spot in their respective Censuses. Analysis: This was the second of only two S-59’s in the 1964 Christie’s sale. Lester Merkin purchased this coin for approximately $2,660 — significantly more than the preceding lot — thus one can assume that the condition and appearance are better, as well. Unfortunately, the last sighting of this coin predates the advent of third-party grading, so the “modern” grade is unknown at this point. However, in both the Noyes and Breen/Bland Censuses, this coin is listed as the second finest example known of the S-59 variety.